A lovely nursery with a LILIAN (BLUE) cushion on the bed. This colourway is no longer available, but it is still available in a PINK version. 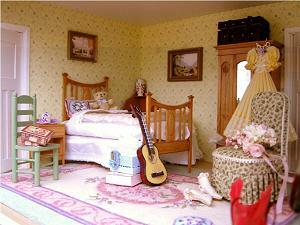 The carpet is the LILIAN (PINK) version. Isn’t that a gorgeous teddy in the picture? 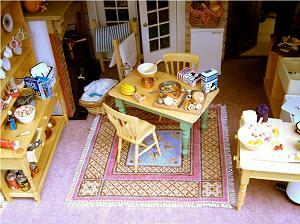 Looking down into a busy kitchen, we get a good view of the ISOBEL carpet on the floor beneath the kitchen table. 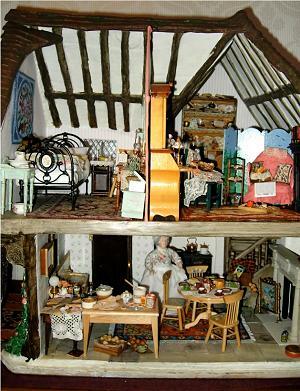 In this view of a small country cottage, there is quite a lot of stitching squeezed into a small space! In the kitchen is a KATRINA carpet and also a COUNTRY COTTAGE firescreen over on the far right of the picture. Upstairs, the room on the right has a SARAH carpet on the floor, and a May (pink) cushion on an armchair (this cushion design is no longer available). In the tiny bedroom to the left is a May (pink) carpet (no longer available in this colourway, although a BLUE version is). A VICTORIA carpet in shades of blue is used here very effectively as a wallhanging. 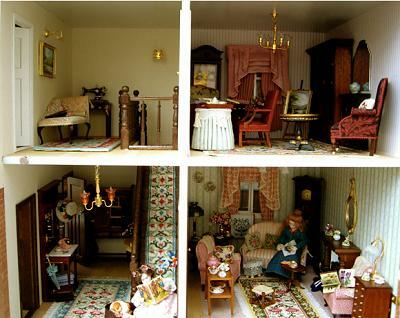 An image showing part of another of Janet’s doll’s houses. This one features so many of the Carole pastel designs, that I think it should be called The Carole House! There is a CAROLE (JADE) carpet in the top left bedroom, and what appears to be an adaptation of the design again in the bedroom on the right. Downstairs, there is a different colourway of Carole – this time, the PASTEL version, in the hallway, along with the matching STAIRCARPET. Finally, in the sitting room on the right is another version of the Carole carpet, stitched in Janet’s own choice of colours. There are also two cushions on the sofa – one is the ELIZABETH design, and the other one is the BARBARA GREEN design. Lurking at the back of the room is a Strawberry Thief needlework stand, which is now unavailable as a kit. 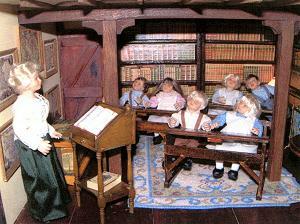 Later, Janet sent us this picture of her schoolroom, where the children keep their feet snug and warm on a “Judith” carpet.